Freedom Party® NYC is the longest running, most legendary old-school dance party in NYC history! Since 2003, Freedom’s brought people together from all over the world to dance to classic party hits from yesterday thru today, be it hip-hop, R&B, pop, rock, reggae or house. 15 yrs + 800 parties…and counting! TICKETS just $10 in advance. $20 at door (1st come/1st serve)! BIRTHDAY SPECIAL: 2 free passes if you were born in April! Email info@freedompartyworldwide.com to claim yours, but quickly–it’s while supplies last! BOTTLE SPECIALS: Free bottle of champagne with every two bottles of liquor purchased! Free platter of next-level tater tots with every bottle of liquor purchased! TABLE RESERVATIONS (Bottle Service/Food): Send an email to info@freedompartyworldwide.com. First come, first serve! HOSTED by artist/dancer/filmmaker Savior Elmundo! VIDEO by Dasheen Nunnie Jordan! 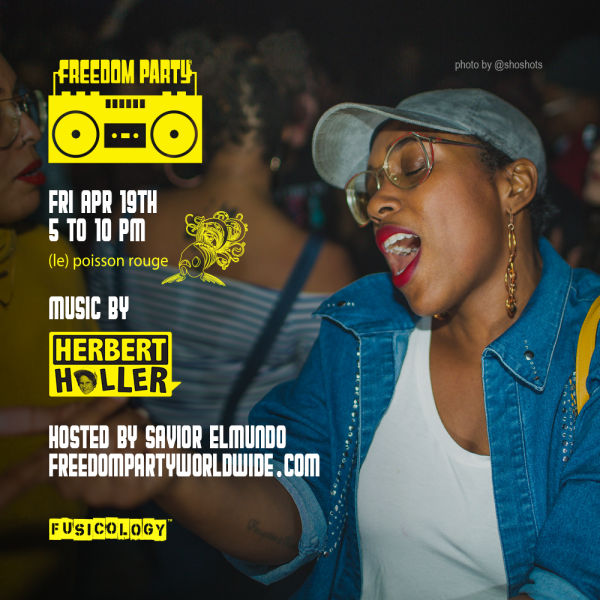 On Friday, April 19th, the Freedom Party NYC takes over (le) poisson rouge, everybody’s favorite downtown music destination! From 5pm to 10pm, Herbert Holler and special guests spin all your favorite hip-hop, R&B, reggae, house, rock and pop hits from the 70s through today. Come down, bring your friends, make new ones, sing along, and we’ll see you on the dance floor! DRESS CODE = Casual but cute. PARKING = Plenty of street parking! Cover Notes: $10 online tickets while supplies last. $20 at the door.